GEORGES SIMENON has exchanged the hobnailed shoes of his inspectors for dancing slippers. 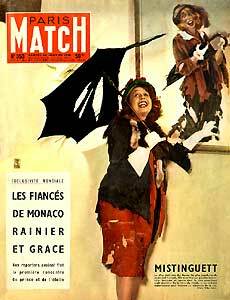 His first ballet, The Room, for the Roland Petit Company, tells, to the music of Georges Auric and before Bernard Buffet's scenery, a police story. A man is killed in a squalid room. An inspector investigates: he reconstructs the "pas de deux" of the crime. The guilty one is a woman. Thanks to two young dancers, Veronika Mlakar and the American Buzz Miller, a former ranch hand, Simenon carried the day at the Champs-Elyséeses Theater. It was Cocteau who discovered the new star, Veronika, in Munich. Roland Petit brought her to Paris: He had never met her, but at the airport he didn't hesitate, recognizing her by her dancer's gait. Simenon, conquered by his first contact with the dance, wants to go farther. With his old friend Georges Auric he is writing an opera where he will have his cops and bad guys sing. 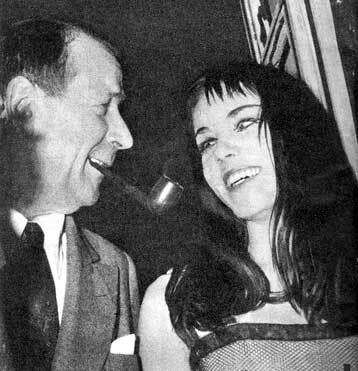 Simenon and Véronika, the heroine of his choreographic "news item".